Australia’s renewable energy pipeline will reach 100 gigawatts (GW) before May, which is a milestone in the country's energy sector. In January and February 6.65 GW of new capacity from 62 assets were added, said Rystad Energy, the energy research and consulting firm. This is more than double the capacity and number of assets that were added in the same period last year. These projects added an additional 2.9 GW of solar (up 7% on the solar pipeline), 1.4 GW of wind (up 4% on the wind pipeline) and 2.4 GW of storage (up 25% on the storage pipeline), bringing the total pipeline to 96 GW, according to Rystad Energy RenewableCube. Also of significance is the storage pipeline grew by 2.4 GW in January and February – just under half the total capacity added last year - compared to a total of 5.6 GW for the entire year of 2018. “This is unprecedented. Half of 2018’s total storage capacity was added in just 2 months, increasing our total storage capacity in the pipeline by 25% on the 2018 (yearend) level. We believe this is an indication of how attractive the long term growth is for renewables in Australia,” Dixon added. 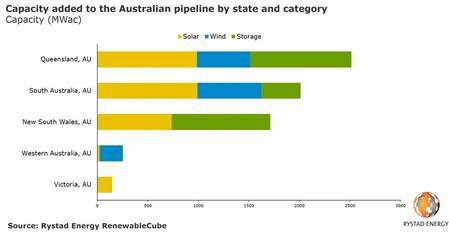 Solar or wind plus storage projects have become the norm in Australia. 16 battery storage added were part of a hybrid development project. This amounted to 1.68 GW of battery additions to the Rystad Energy database, an increase of 36% to the total battery pipeline. 490 MWAC of pumped hydro also entered the pipeline in January/February this year – an 8% increase on the pumped hydro pipeline. The most notable storage additions were the 500 MW battery associated with the Sunshine Energy Project, the 400 MW battery associated with the Desailly Renewable Energy Park, and the 250 MW battery associated with Robertstown solar farm.